Continuous sunshine and glorious sailing conditions for most of the time created a perfect setting for the second of the Club Spring Points races held on the 30th of March with local legend, Billy (Scratch) Hitchen as the Race Officer taking time off from both his fishing exploits and promoting his recent best selling local book. The 11 strong Solo fleet was first away in a glorious force 2 breeze blowing down the estuary and Graham Cranford Smith was fast off the blocks putting his recent Merlin Rocket Open Meeting disappointments behind him by leading at the Blackstone windward mark. The subsequent long run against the tide to a distant Saltstone mark on the “other” side of the Bag however allowed many other boats to have moments of glory at the front of the fleet including Andrew (Tubes) Thompson, recently returned from repairing hurricane damage in the BVI, and locals Billy Jago, Simon (Yotter) Yates and Andy Savell. However; Cranford Smith managed to regain the lead at Saltstone and then built up a commanding margin on the returning beat through the Bag only to then become becalmed in Yalton Creek, thereby allowing the whole fleet to catch him. There was a massive raft of Solos at the Yalton mark, but yet again, Cranford Smith amazingly found a way to escape from the chaos and in a beautifully increasing breeze enjoyed perfect windward sailing under a blue sky to cross the line first from Malcolm Mackley in “Mr Blue Sky” with Simon Yates third. Such was the supreme performance and good fortune of Cranford Smith that he came ashore having fully exorcised all previous poor recent Merlin Rocket Open Meeting performances. The handicap fleet of 11 boats was a mixed bag of super fast Musto skiffs, Phantoms and Merlins together with Salcombe Yawls and a growing mix of standard and radial rig Lasers. Mindful of some junior sailors sailing, the OOD elected to shorten the handicap fleet course on the water using his own classic launch. 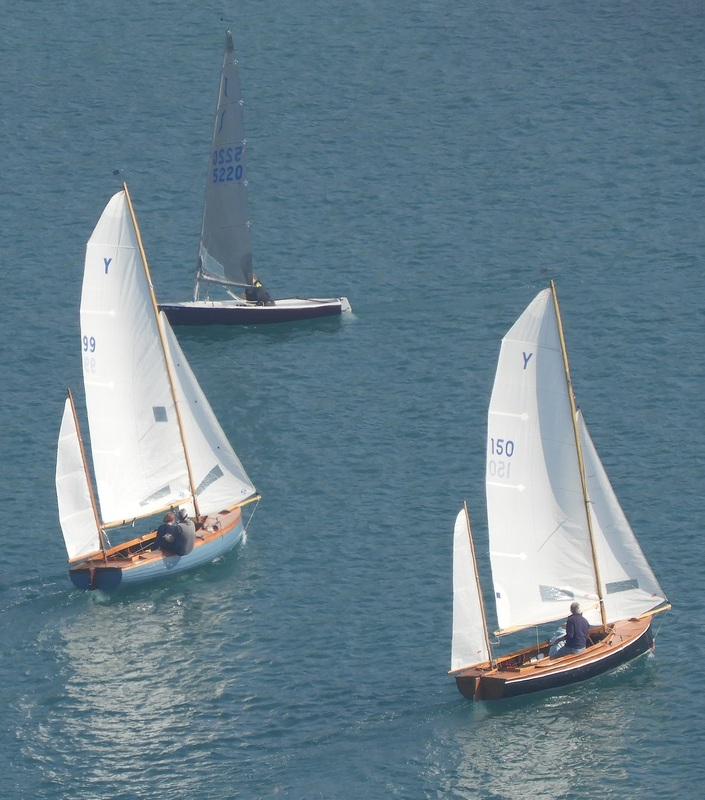 At this point the faster boats had not really had long enough to stretch their legs and it was the three Salcombe Yawls that created a lock out of final handicap podium positions. The Yawls sail to two different handicaps depending on boat age and ability and on handicap Geoff Gilson and Chris Spencer Chapman were relegated to third position with Stephen and Lesley Galvin taking a well deserved first place from another husband and wife team of Jon and Clare Lewis.